We recently posted a report on the completion of scheduled work on the Ken Burton Trail. 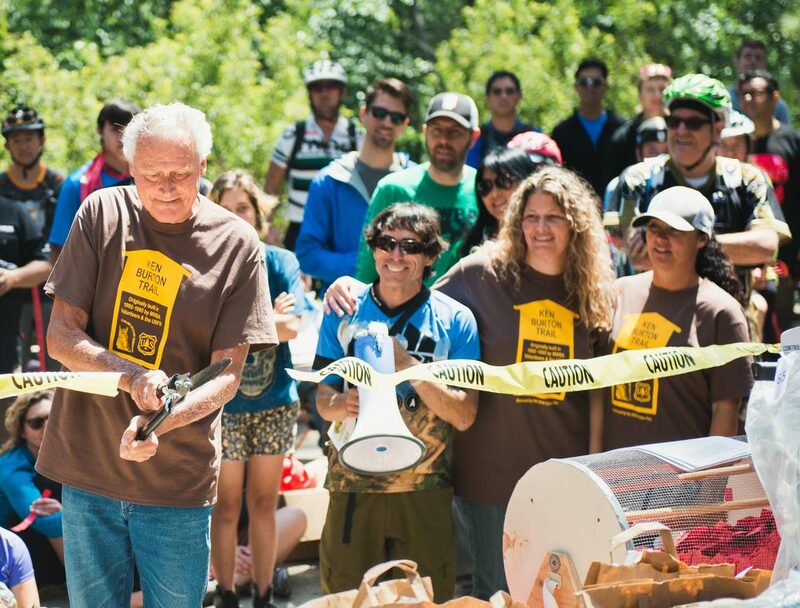 On May 1st the Mount Wilson Bicycling Association, who partnered with CORBA to restore the trail, held their annual Pancake Breakfast fundraiser at Gould Mesa Campground in the Angeles National Forest. 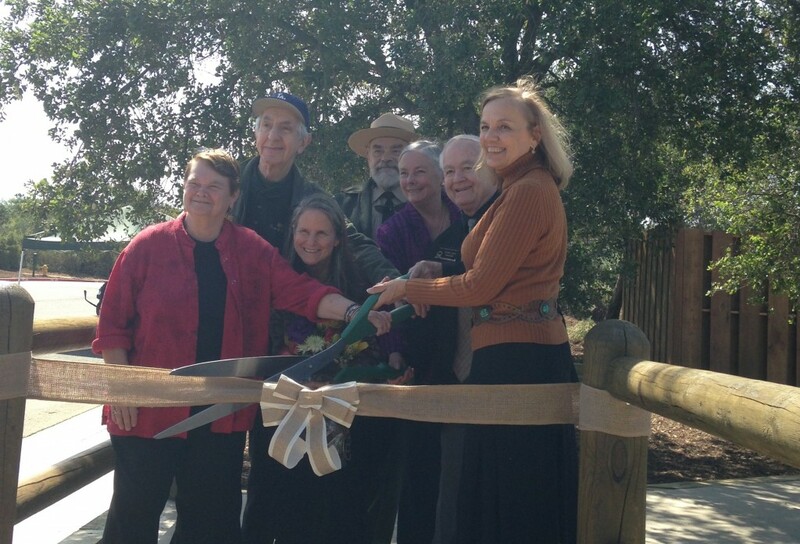 It was perfect timing for all to celebrate the completion of the Ken Burton trail. Jim Burton cuts the ceremonial ribbon, as Steve Messer, Matt Lay and Jenny Johnson of MWBA, and Ken’s daughters Heather and Tania look on. Photo by Mark Skovorodko. While the Pancake Breakfast was an all MWBA event, many CORBA members were also present to enjoy the celebration. Through the wonders of social media, we were able to connect with Ken Burton’s family, many of whom came to the event to celebrate the reopening of their “dad’s trail.” The cermonial ribbon cutting was performed by Jim Burton, Ken’s brother, with Ken’s daughters Heather and Tania, Steve Messer from CORBA, and MWBA’s Jenny Johnson as MC. Heather gave an inspiring speech about her dad, his love of trails, bicycles, and the National Forest where he served as Battallian Chief before being killed by a drunk driver on Angeles Crest Highway in 1988. A moment of silence was observed in honor of Ken Burton before the ribbon was cut. 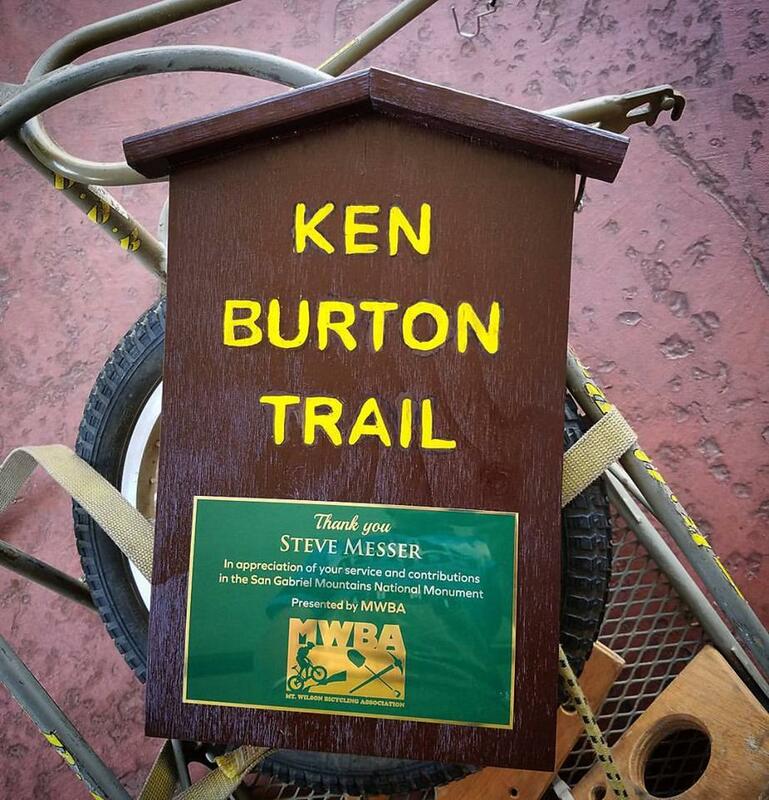 MWBA thoughtfully honored Steve Messer with a special plaque of appreciation, made in the style of the original Ken Burton trail sign. Volunteers who gave two or more days of volunteer work received a commemorative T-shirt and a certificate of appreciation from the Forest Service. While the project was initiated and led by Steve Messer of CORBA, it was truly a partnership with both CORBA and MWBA volunteers working together to complete the trail restoration project. It was a great day to celebrate the completion of one trail project, as we prepare to move on to the next project: restoration of the Gabrielino trail from Ken Burton trail junction to Switzers. CORBA has applied for a grant from REI, and will partner with the Los Angeles Conservation Corps, Bellfree Contractors, and again, the Mount Wilson Bicycling Association to complete the project. We are having a severe El Nino event this winter; as a result the weather forecast is for many heavy rainstorms in the early months of 2016. 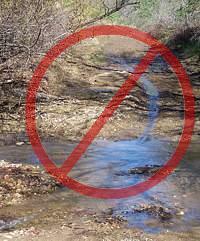 That will help our drought situation, but will have seriously bad impacts on our trails. As well as muddy conditions that interfere with their use, described below, the rains could be severe enough to erode some trails into huge ruts, and even wash them away in some cases. There may be more mudslides in Pt Mugu State Park (Sycamore Canyon) like we had last year. Furthermore, the rain will spur the chaparral to overgrow the trails, a condition we haven’t had to deal with much over the past couple of years because of the drought. The combination of waterlogged soil and high winds could blow trees over. We’re expecting to have special trailwork days to repair these damaged trails and hope many mountain bikers will want to help us get them back into shape! Most trails in our local riding area don’t respond well to rain. They have a high content of clay that turns into sticky, slippery muck that binds to everything it touches. It builds up on the tires, like a snowball rolling downhill, until it jams on the frame and the wheels won’t budge. Some models of clipless pedals won’t let go when full of this mud, resulting in the bike and the attached rider lying sideways in a puddle, or worse. Most wet trails don’t respond well to use until they’ve had time to dry out. Hikers and horses make holes and ridges in the trail that become as hard as concrete when the trail dries. These holes and ridges are good for twisting ankles. As a rule of thumb, if your foot, tire or hoof makes an impression more than about 1/8 inch deep in the dirt, the trail is still too soft to use. Give it another day or two to dry out before using it! On wet trails, bikes make grooves along the trail. The next time it rains, the water runs down these grooves and turns them into little ruts, then large ruts that destroy the trail. The mud is particularly hard to remove. It sticks to the bike and shoes, no matter the efforts to remove it, rubbing off on the bike rack, car carpet and gas/brake pedals, making them slippery. Once home, it takes the careful use of a garden hose to remove the mud but not force water into the sensitive parts of the bike. 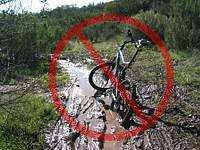 For these reasons, riders are well advised to stay off the trails after a rain until they have dried. How long to stay off? That depends on a number of factors including the particular trail, how much rain it received, how much sun it gets after the rain (is it in the shade or face south? ), how warm and windy the weather is, and so on. After an isolated light rain you can probably ride the next day. After a heavy rain, you should wait several days. This is something where common sense and experience will help. 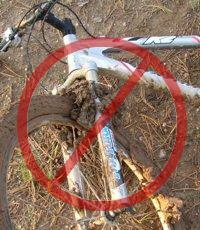 Remember, tracks deeper than 1/8″ mean the trail is still too soft to use! –Space Mountain (Los Robles Trail West) to the picnic table is almost always rideable, even right after a big storm. However, it can be pretty mucky from the picnic table to Potrero Road. –Rosewood Trail is pretty good, but not quite as resilient as Space Mountain. –Dirt Mulholland around Topanga State Park. 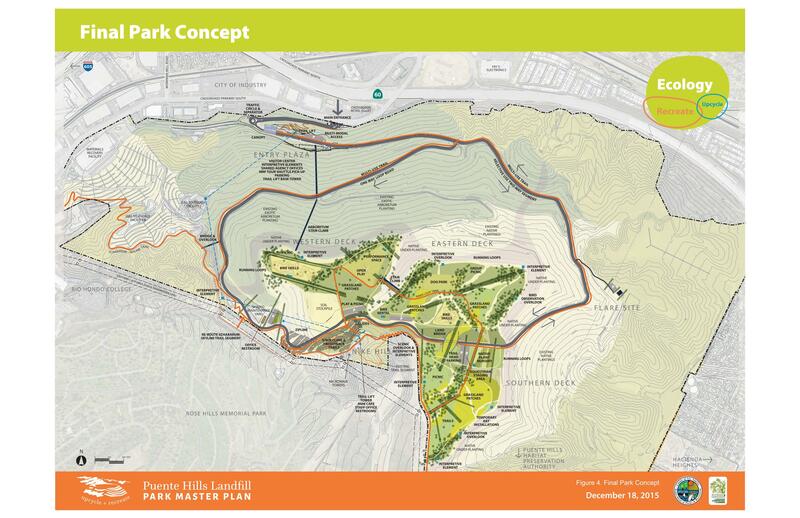 The decommissioned Puente Hills Landfill is preparing to become the newest addition to the Los Angeles County regional park system. The area has outlived it’s usefulness as a landfill, and is presently a blank canvas waiting for a public park to be developed. 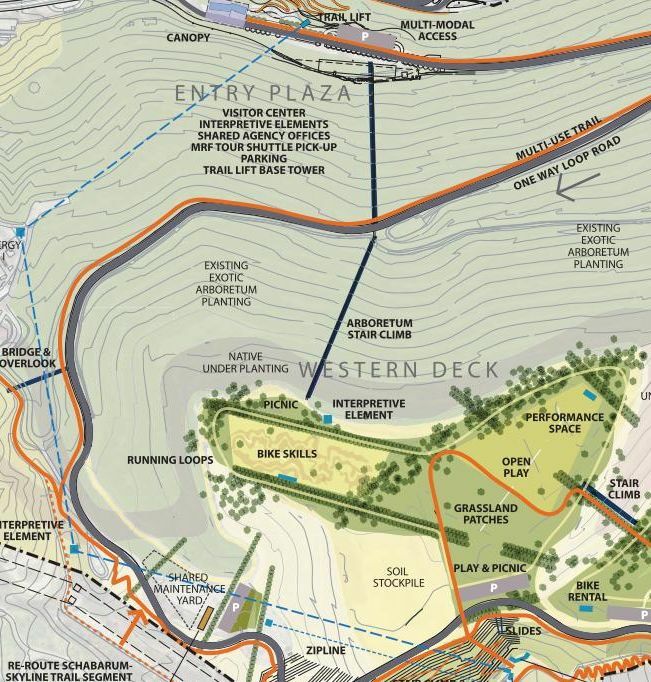 The proposed park is close to Chino Hillls, Turnbull Canyon and the Emerald Necklace, all areas popular for outdoor recreation, including cycling and mountain biking. Final Draft Park Concept, Tuesday, November 3, 2015, 6:30 – 8:30, Wallen L. Andrews Elementary School, 1010 S Caraway Drive, Whittier, 90601. We invite mountain bikers and CORBA members to attend one or more of these meetings. 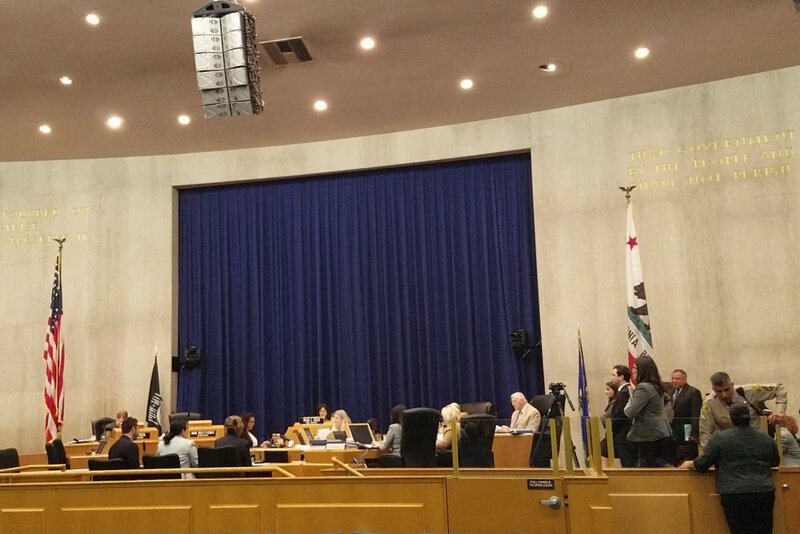 The more the County hears demands for Bike Park facilities in the Los Angeles, the more likely we will be to get one. Whatever park ideas people have can to be presented and discussed at the initial meetings or by contacting moconnor@parks.lacounty.gov. 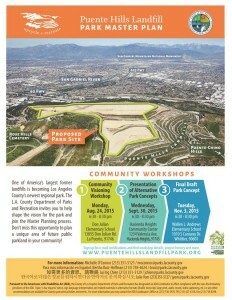 More information can be found at www.PuenteHillsLandfillPark.org. Hello All, My name is John (Rusty) Redican, I’m a fellow cyclist and LAPDOfficer. This reminder is not an official LAPD news blast, but me as a fellow cyclist and community member arming you with a little information to keep you and your property safe. Due to another salient event, where a fellow cyclist had his bicycles stolen out of his garage. I need to advise you all about a ring of high end bicycle thieves that we (LAPDWest LA Division) arrested a couple years back, who may or may not be at it again. That arrest was only made possible due to cooperation between the cycling community and the police. First off, be very cautious on what you post on social media, i.e. Facebook, Instagram, Strava and similar forms of tracking and communication we all use for our shared love of cycling. A few years back, this ring of bike thieves, based out of south Los Angeles, were responsible for millions of dollars of bicycle thefts, from San Diego County to Ventura County. They would follow cyclists home from group rides, scour FaceBook and other social media for intel on cyclists and their homes, so they could conduct surveillance on you and break into your garage or storage areas to steal your bicycles. They would do this during the day mostly when no one was home, but also at night while you slept. At times they would cause damage to the garage, but most times they were very surreptitious about it and the only evidence left, was the absence of your property. The majority of the bikes they targeted were well worth (as you all know) the chance for them to get caught by the home owner. At the time, they used a very clean and newer model silver, 4 door Audi sedan with bike racks on it. The suspects in the cases I’m referring too were all male hispanics in their mid to lat 20’s – early thirties, between 5’6” and 5’9”, 175 lbs to 220 lbs, not climbers. Again, I’m not saying this is definitely them, but the MO used in the theft of bikes from one of our fellow cyclists in Torrence, last week is very similar. So be advised and be cautious of what you put on social media, NEVER have the starting point to your ride be your residence, and be cautious on who you share your photos and information with. Also, you don’t have to be paranoid, but be aware of your surroundings and if you notice a vehicle following you, or the same vehicle in 3 different locations, that may be a clue, and take not of the lic plate number, or any other distinguishing characteristics of the vehicle and occupant(s). Criminals are not dumb, and have evolved with the technology, so a little operational security will help you keep your property that you love, and work hard to obtain. If you see anything suspicious please be a good witness, don’t physically get involved, as you never know what these criminals are armed with, but immediately call your local police department. The answer to all of the above questions was a “yes.” The National Park Service presented four alternatives based on the study findings. The first NEPA-required “no action” alternatives serves as a baseline against which we can compare the alternatives. Alternative B allows the NPS to offer “technical assistance” to existing land managers within the study area, but falls short of allowing the NPS to make any direct capitol investments. 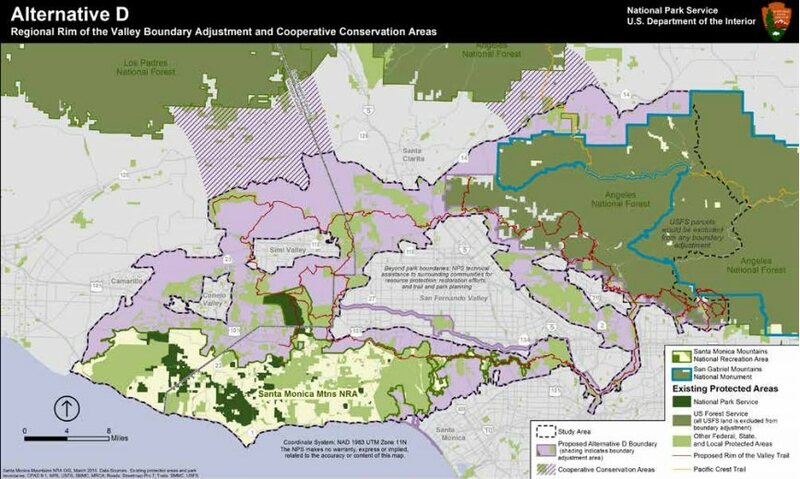 Alternatives C and D expand the authorized boundary of the Santa Monica Mountains National Recreation Area. 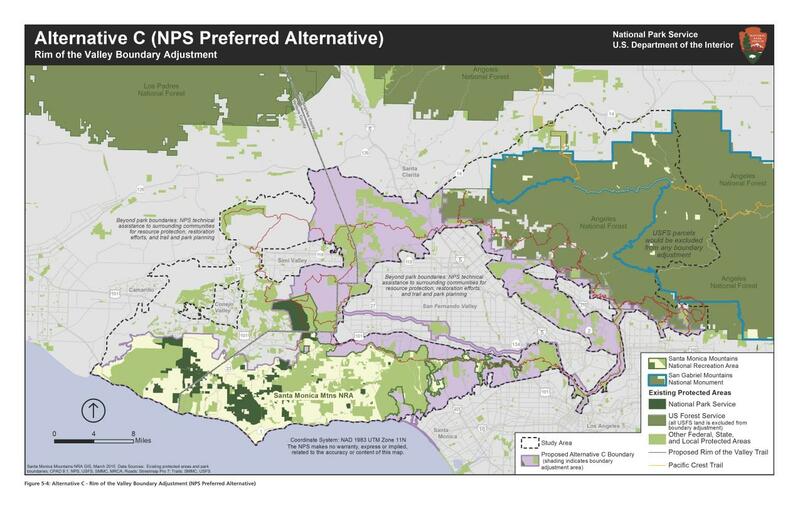 What the boundary expansions really mean is that the National Park Service will be authorized to offer technical assistance to existing land managers for any project that enhances recreation, or restores habitat and connectivity. Under Alternative C or D, the NPS is also authorized to spend money on capitol projects within the expanded boundaries. We believe that the largest operational boundary proposed under Alternative D would have the greatest long-term benefit for recreation, bio-connectivity, wildlife and the communities adjacent to the study area. It also includes the wildlife corridors linking the two areas of the Angeles National Forest separated by Highway 14, as well as between the Santa Susana Mountains and Los Padres National Forests. The boundary expansion does not come without concern. The NPS, like most public land agencies, is currently under-funded. We would hope that any boundary expansion would come with an increase in funding sufficient to at least maintain the current level of service across the expanded NRA. During the course of the public meetings we heard a lot of misinformation and a misunderstanding of what the boundary expansions mean. The Federal government will not be taking anyone’s property against their will. Existing land ownership rights and management authority is respected and maintained. One thing that would change is the permitting of landfills. In our comments, we asked for the existing landfills to be excluded from the proposed NRA expansion to eliminate the need for additional permitting. 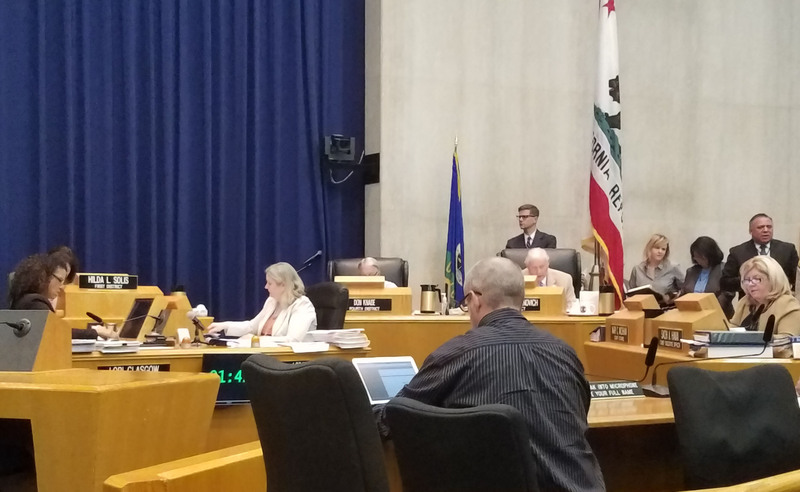 We also feel that the recently completed San Gabriel Watershed and Special Resource Study which proposed a San Gabriel Unit of the NRA, must be considered and its findings also addressed by any congressional action to the effect of either. The Rim of the Valley trail system is also important to us. It’s a proposed multi-use trail network that will encircle the San Fernando Valley, and perhaps Simi and Conejo Valleys. We feel the National Park Service will be in a good position to help facilitate its completion under Alternatives C or D.
It will probably be another year before we see a final recommendation from the study. From there it will be up to Congress to decide what to do with the recommendations.